Click here to download a larger map (PDF). The MAXIMUM speed limit is 5 MPH throughout the campground. Unnecessary dust is created above this speed as well as endangerment to life and limb. This requirement is strictly enforced; your cooperation is expected. Quiet time begins at 10:00 PM. Excessive noise after that hour and until sunrise will not be tolerated. 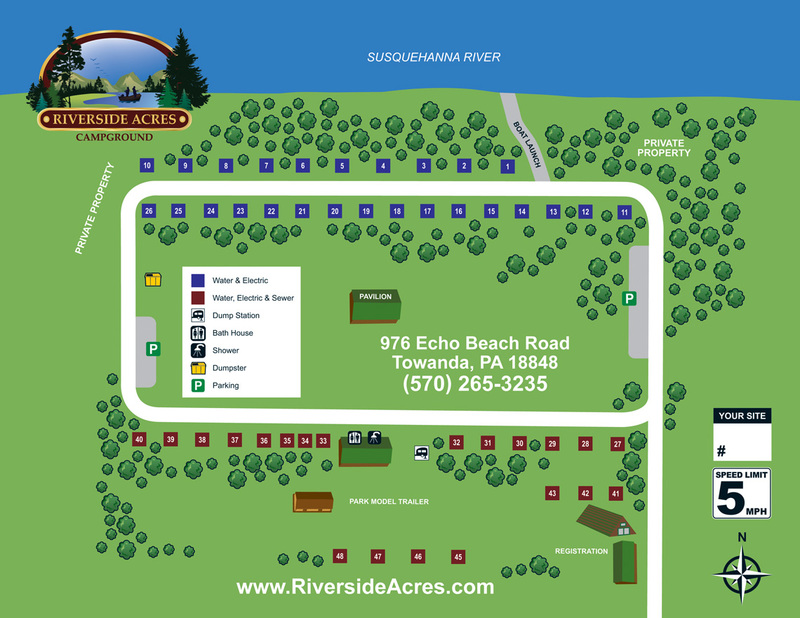 Campsites will be limited to one camping unit only (RV, tent, van, truck, etc). Outside fires will only be permitted in designated fire rings. Fire rings shall not be relocated within your site area. Please no trash in fire rings - these are not conveniently placed garbage cans. No rubbed backed rugs allowed. Rugs kill the grass in a heartbeat. A small mat is permissible. Environmentally friendly rugs are now available at many camping stores. Tables must not be moved from existing site without specific permission from management. Please return all tables relocated within your site area to their original place before leaving. For safety reasons clothes lines are forbidden. Small clothes racks are permissible. NO ELECTRIC HEATERS. No exceptions. No house type refrigerators allowed on grounds. Subletting of sites is prohibited. Check out time is 1:00 PM. If you wish to stay another day, please re-register by 11:00 AM. Pets are welcome if kept on a leash or otherwise contained AT ALL TIMES. They shall be cleaned up after. Pets shall not be left unattended at your campsite. Dishwashing or clotheswashing in bathrooms is strictly prohibited. Leave your site as you found it - neat and clean. Pennsylvania law prohibits persons under 21 from drinking alcoholic beverages. This rule also applies here. Campers shall conduct themselves in a decent and orderly manner at all times. Children under 6 years are not permitted in bath house unless accompanied by an adult. Children 12 and under shall be adult supervised while showering. Children are never to be left unattended in the campground. Anyone (camper, visitor or child) putting anything into our septic system other than body washes, sink water, and toilet tissue will be subject to a $250.00 pumping charge and eviction from the campground. Don’t litter! Contain all trash in plastic garbage bags and dispose of at trash dumpster. This dumpster is for food and drink type garbage only. DO NOT THROW CIGARETTE BUTTS ON THE GROUNDS. No tree cutting or otherwise damaging trees in any way. DO NOT TIE YOUR PET TO THE TREES. No camper or vehicle washing. No plastic tarps under your tents - it kills the grass. Most tents already have waterproof flooring. By accepting a site in this campground, the person registering automatically accepts the rules that govern it and will be held liable for cost of damage or repair. Children and or guests will comply. Violation will be considered grounds for revocation of camping permit. This campground does not assume liability for damage to tenant’s property inflicted by other campers, visitors or their children.